The concept of the concentration grid exercise has been in existence for many years. Over the years, many coaches have used concentration grids (sometimes called focus grids) in an effort to improve the performance of their teams and athletes. The objective of the concentration grid exercise is to find and select in sequence each of the numbers (randomly arranged and presented) in a grid. Performance is timed as the athlete is challenged to find each number in sequence to complete the grid as quickly as possible. Success calls for sustained focus and concentration. Highly focused athletes are able to condition themselves to complete a concentration grid quickly and efficiently. The concentration grid exercise has been a particular favorite of baseball/softball coaches. Many current and former ballplayers have seen or done a concentration grid exercise using printed/paper sheet (and a pen) – and a stopwatch. For some baseball/softball teams, concentration grids are a pre-season ritual. Coaches and athletes now can save paper and practice their focus more frequently by using the new Concentration Grid app on their Apple or Android mobile device. The app was developed for use by coaches, athletes, students, teachers, parents, children, adults – by anyone who wants to practice their ability to focus. The Concentration Grid app can generate random concentration grids of multiple different sizes and conveniently uses the device touch screen (no pen, no paper needed) for gameplay. The user interface is very clear and straightforward (intended to look like a paper sheet); progress through the grid during gameplay is indicated clearly for the athlete and grid completion times are automatically recorded and displayed. Initial gameplay with the app has established a few benchmark grid times: The long-time concentration grid standard is a 10×10 grid – which a master (after practice) should be able to complete in under 4 minutes. Practiced grid masters will complete a 3×3 grid in under 3 seconds, a 5×5 grid in under 15 seconds, a 6×6 grid in under 30 seconds, and a 7×7 grid in about 45 seconds. No one has yet shown a time under a minute for an 8×8 grid. A target time for completing a 9×9 grid is 3 minutes. A 12×12 grid will likely take 10 minutes to complete. Few have tried a 14×14 grid. Sustained attention and effort are rewarded with improved performance and reduced completion times on any grid. Coaches can vary conditions to challenge their athletes during gameplay. The grid exercise can be practiced in complete quiet or with background noise/distractions intended to simulate "game day" conditions. The app is perfect for use all season long on road trips or during short breaks at practices – wherever and whenever mobile device access is allowed. Athletes can use the app to exercise their concentration ability all season and all year. The Concentration Grid app will display the grid time (elapsed time to complete the grid) from gameplay – a screenshot from gameplay can be saved (which athletes can send to their coach). The app maintains a history/data file on the mobile device that can be used by the athlete and coach to track performance/improvement. The app also includes a share feature. Athletes can share personal best gameplay data with friends and teammates and to post grid times and screenshots on social media (including at the Concentration Grid community). 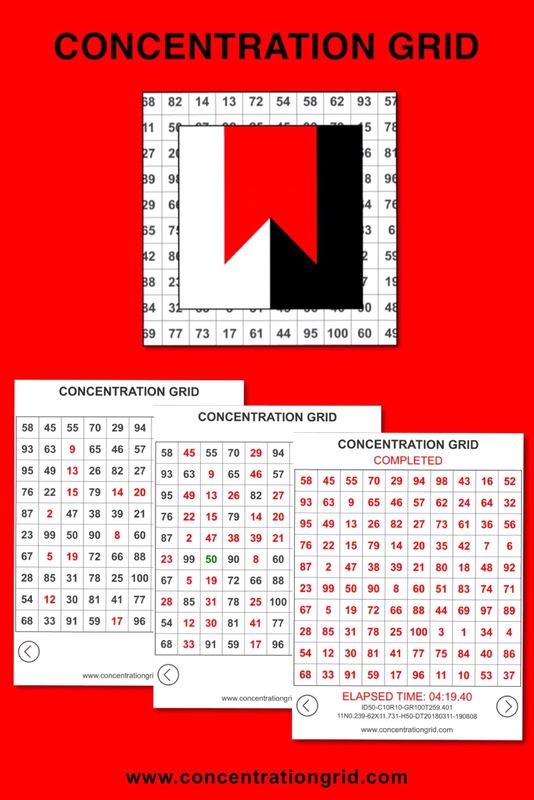 The Concentration Grid app is available (for 99 cents) on the Apple Store for iOS devices (e.g. Phone, iPad, iPod) and at the Google Play store for Android devices. Free gameplay is available over the web at www.concentrationgrid.com. Copyright 2016-17. Concentration Grid d/b/a Stalwart Group LLC. All rights reserved.